When looking at the evidence for the Iron Age on Dartmoor it soon becomes obvious that something dramatic occurred around the beginning of the period. Look at any map of the moor and you will see that it is studded with hundreds of hut circles and other features from the Bronze Age but then suddenly the scant evidence for the Iron Age shrinks back to the moorland fringes. It has been suggested that there was a, “catastrophic change in the fortunes of the upland inhabitants“, Gerrard, p.65. What little evidence there is suggests that the permanent settlements in the middle of the moor were abandoned and the people moved down to the edges of Dartmoor where they established hillforts, settlements and enclosures. There is a plausible argument for thinking that some of the moorland settlements were used on a temporary basis in the summer grazing period, Gold Park being one such place. But what caused the dramatic migration away from the moor? One theory is that there was a noticeable deterioration in the climatic conditions which gave rise to much colder and wetter weather patterns. It is also possible that due to overcropping and insufficient fertilising the soils became hungry and undernourished which resulted in them becoming acidic and peaty. Both of these factors would have led to continuing crop failures thus leading to a food shortage that necessitated the migration away from the central moor. So, to start at the root of Iron Age Dartmoor, who were the inhabitants? They were members of the Dumnonii tribe which inhabited most of Cornwall, Devon and Somerset. They were NOT a Celtic tribe as many authors suggest, there is no such race as the Celts, it is a term which describes a culture not a race of people. The name of the tribe is said to translate to the, “deep valley dwellers” and it is supposed that they spoke a Brythonic dialect that stemmed from the old Cornish language. It seems that when compared with other Iron Age tribes the Dumnonii were not as politically centralised and instead seemed to live in smaller clan groups which were dotted around the region in clusters. One vital factor that illustrates the Dumnonii’s isolation is the distinct lack of coin evidence as noted by Cunnliffe, p.211-3, “The extreme rarity of Durotrigan and Dobunnic coins or pottery in this region suggests that they remained largely isolated from the affairs of their neighbours“. 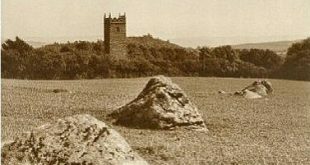 I would also add that up until about 300 years ago little had changed from this situation on Dartmoor. But what these people did introduce was a new form of metal-working, namely that of iron. At Kestor excavations have found evidence of a metalworker’s hut, a small bowl furnace containing iron slag, a forging pit, a quenching place and a anvil. The iron ore was found to have come from the specular haematite which is found 10 miles way at Hennock and produced a much more malleable metal that was easier to make and repair. It is noticeable that there does seem to be a chain of events which stem back to the worsening climatic conditions. Crops were failing and there was pressure on what food supplies there were, the moorland inhabitants moved to the fringes and began to build impressive hillforts that also served a defensive purpose. Metalworkers began producing better iron weapons to defend these sites and whatever was contained in them. All these factors point to a changing society that was becoming more clan based and territorial with a need for protection or aggression. When looking for evidence for Iron Age Dartmoor it is necessary to disregard today’s park boundary as clearly 2,700 years ago the moorland inhabitants were using different tribal boundaries. Therefore it is necessary to include locations which in modern terms would be regarded as being outside Dartmoor. The map below shows the major Iron Age hillforts and settlements that have so far been identified. As can be seen there are three distinct clusters of hillforts, one in the north-east, another to the north-west and a south-eastern cluster. All of these ‘Clan Clusters’ seem to contain on average five hillforts that occur within a five mile radius of each other, this can be seen in other western areas such as Wales. Does this reflect three sub tribes or clans within the overall Dumnonii tribal society? Interactive Map – click each location symbol for an aerial photograph of the feature. It is clear that the main settlement type is that of the hillfort and these vary in size and construction with some having a single defensive wall (univallate) to those with several defensive walls (bivallate and multivallate). The hillforts are by in large, “hilltop circuits of banks and ditches”, and “may be defined as major fortified sites, defensible against human attack, and exploiting the natural terrain to this end“, (Pearce, 1981, p.112). The heights at which the hillforts occur on Dartmoor vary from 136m to 329m with most being located near a major river. The table below shows the major settlements, their altitude, OS grid reference, NMR record number and type, hillforts are categorised by their defences. Some of the hillforts have utilised previous Bronze Age structures and many have seen several phases of construction which consisted of palisades, walls and ditches. But what was their purpose? There are many suggestions as to what they were used for and apart from the obvious defensive role these include; centres for exchange, storage, religious activities, manufacture, and meeting places. In addition it can be considered that they made political statements which let people know the power of the clan leaders and their importance. The sad fact with not just the hillforts but all Iron Age settlements is that there has been very little investigative work done on them. Yes, many have been surveyed and scheduled but hardly any exploratory excavations have been carried out. I would love to know if there are any artefacts in common to the clan clusters or even the tribal area. For instance, work in South Wales has revealed that the Silures seemed to have a liking for red decoration and much of their jewellery used the horse as inspiration, does such a phenomenon exist on Dartmoor? In some cases the sites of the Iron Age settlements were used in later stages of history which took the occupation period well into the medieval period. So once again the palimpsest of Dartmoor gets re-written time and time again building up layers of occupation and land use. Sadly this is only a brief glimpse at Iron Age Dartmoor but to do the topic full justice would entail a whole website of its own. For anybody who wants to delve further into the topic then the ADS can give more specific detail as can the books in the suggested reading list below. Cunnliffe, B. 1993 Wessex to AD.1000, Longman Publishing, London. Gerrard, S. 1997 Dartmoor, Batsford, London. Todd, M. 1987 The South-West to AD1000, Longman Publishing, London. Fox, F. 1973 South West England – 3,500BC – AD600, David & Charles, Newton Abbot. Pearce, S. M. 1981 The Archaeology of South West Britain, Collins, London.